Recently I was asked by a couple of friends for some recommendations of what trains to see in Paris, and where to go to find them. I started to write down a few notes, and before I really knew it had compiled quite a text on what to see in and around the city. Now if it was useful to them I figured it might be useful to others as well- after all I think Paris is a fantastic location for a rail trip, and often overlooked- especially by those in the UK for whom it really isn't very far at all to travel! Note that this article is complied largely from my own sightings on trips which have covered a couple of years. 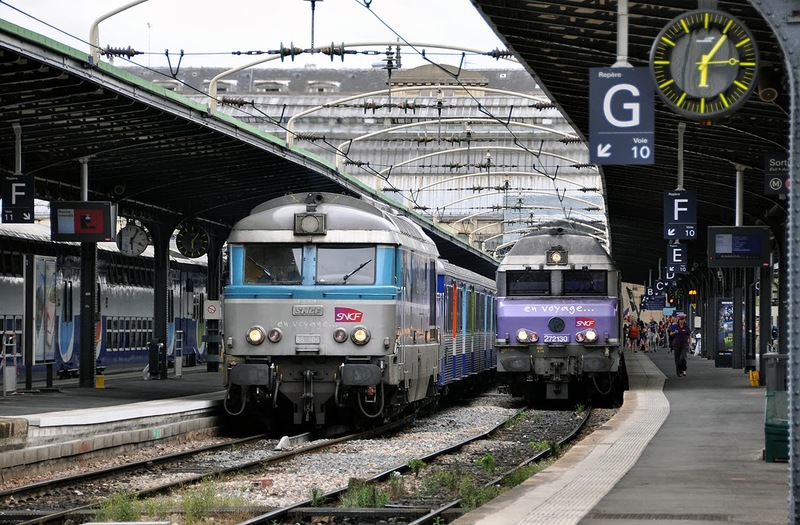 Things may (and will) change without notice as the SNCF continue to upgrade their system. As far as I am aware this text is largely correct as of Summer 2013. Please don't hold me accountable if it is not accurate or you do not see the trains I have listed here! The station many first arrive at by Eurostar. Amiens route (and possibly others). double headed (into Paris in the morning, back to Laon in the evening). There is a weekend train to/from Le Treport worked which is also diesel hauled. All suburban trains now believed to be units. BB17000 could occasionally turn up still maybe? A trip to Creil may be worthwhile for possible freight and BB67400 working RRR sets between Amiens, Creil and Beauvis. All weekday trains on the line from Paris Nord to Beauvis via Pearsan Beaumont are units (the exception is the Weekend Le Treport train mentioned above). Just 10 minutes walk from Gare du Nord, Gare de l'Est has a very wide range of traction for viewing. Electric locos work intercity trains out East though they are not as plentiful as from Gare du Nord. CC72100 'Big Diesels' work Intercities trains to Troyes/Culmont/Belfort. Departures of the big diesels are not regular with some big gaps in service. The best time to see them is probably early evening with about 4 departures between 16:42 and 18:42. Note there is a lot of engineering work on this route at the moment, and not all trains to Troyes/Culmont are hauled! BB67400 work two peak hour trains each day to/from Le Ferte Milon. Locos sit on the country end of RIO stock. BB17000 Work quite a lot of ECS movements- likely to be found bringing in/out stock for the Diesel trains unless it the inbound stock goes straight out again. There may still be some passenger turns (particularly in the peaks) on the line towards Meaux with BB17000. These may now be units. If you want to see EVERYTHING out of Est then try Noisy-le-Sec, though this is a busy station and light is poor in the evenings for departures from Paris. stations either side of it. Take RER E from Magenta (closer to Gare du Nord than Est). Not as many locos here as some other terminal stations but still worth a visit. The main part is likely to be filled with TGV's as this is the main station for the busy TGV Sud-Est line. There is another part of the station on the left side which is where any loco hauled trains tend to be. These are mostly working Teoz services with BB26000 'Sybic's'. BB36000's work into Gare de Lyon with their only passenger turns- the 'Thello' sleeper trains to and from Italy. Of note here are the ECS locos which on my last visit (a few years ago) were some very elderly BB8000 locos, many in various incarnations of the SNCF grey/orange scheme. I understand these may now have been replaced by slightly less elderly locos, but still in a variety of liveries. Suburban trains no longer leave Gare de Lyon as these trains now continue underneath Paris on the RER network. Shortly south of the station can be found the terminal where the yellow 'La Poste' TGV sets are based. The smallest of the Paris terminals, effectively an annexe to Gare de Lyon which is at capacity. It is not very pretty... but quite open. Some loco hauled Teoz and Intercities trains leave from here. Though not a huge number. Again the old locos can appear on ECS movements. You can also see the shunting of the car terminal from here. Just across the river from Gare de Lyon, a nice station if not particularly busy... it is possible to turn up at midday and find the whole station almost totally empty! Most services from here are loco hauled. Intercities/TER to Orleans and Teoz to Tolouse. As with Gare de Lyon suburban services have now been absorbed into the RER network and do not serve this station. Major re-building works have taken place on parts of this station since my last visit. Imagine a cross between Euston and Birmingham New St... Montparnasse is not pretty and there is very little merit in taking photos here at all. This station in a previous guise was the Gare de l'Oest- the famous scene of the 'steam loco hanging out of station' photo. Despite its appearances the traction on offer is good- so find a spot somewhere else to view it! Since the refurbished BB7600's have virtually replaced the last of the Silver EMU's (Z 5300) almost all suburban trains from Montparnasse are now loco hauled! A few of the EMU's may still be working- and these are worth catching if you can... they are the last 'classic' SNCF units in France (some have been exported to Romania!). On my last visit we did not see any working though I have heard more recent reports of them being out, particularly during the peaks. BB7600 and any EMU's tend to work trains to Ramboillet Other trains are in the hands of the modern 'Alsthom Prima' BB27300's. All the loco hauled trains from Montparnasse work with VB2N double deck stock. Loco's are on the country end. Intercities trains run to Chartres and Le Mans. Many of these are units (particularly to Chartres) but some are loco hauled with either BB7200 or BB8000. There are also additional loco hauled trains in the peaks. Heading out to somewhere like Versailles Chantiers and then onto maybe Saint Cyr would not be a bad bet to see the Montparnasse trains- though I am sure there are other options on this route. The TGV Atlantique runs out of Montparnasse, though this diverges from the classic line soon after leaving the station. A lovely station (and painted by Monet should this be of interest!) and a haven for the elderly BB17000's on suburban passenger work. BB15000 and BB26000 'Sybic' work fairly frequent Intercities trains to Cherbourg, Rouen, Caen and Le Harve. Some of these are units, and many of these trains work push/pull- locos usuall at the country end. Those which do not work push/pull propell into the station without a pilot loco. These trains use the far R/H platforms- which are not easy to photograph at the country end for long trains. Most inner suburban trains are units. Outer/Middle distance suburban trains are all loco hauled. BB27300 work most services on VB2N double deck stock. BB17000 work some services, often interworking with the Alsthom locos and usually on RIO stock. The are most prolific on the short inner suburban trains to Ermont-Eubonne (only about 25 minutes total journey). They therefore appear quite frequently... but before long you are seeing the same locos again! Some BB17000 out of St Lazare are in 'En Voyage' livery- elsewear they are all tend to be in Transillien white/blue. All push/pull suburban sets tend to have their locos at the Paris end. If you walk to the very end of some of the long platforms you can get a good view of trains approaching the station. Outside of Saint Lazare I recommend the station at Asnieres sur Seine which is busy and has some interesting angles. Further out Villennes sur Seine has a car park south of the station which affords good angles in both directions (light good for southbound trains) There are less trains here- just the half hourly service to Mantes le Jolie which stops and the through Intercities. Do not expect to find any amenities (like somewhere to buy a sandwich) in this small town! BB22331 passes Juvisy with a Teoz service. 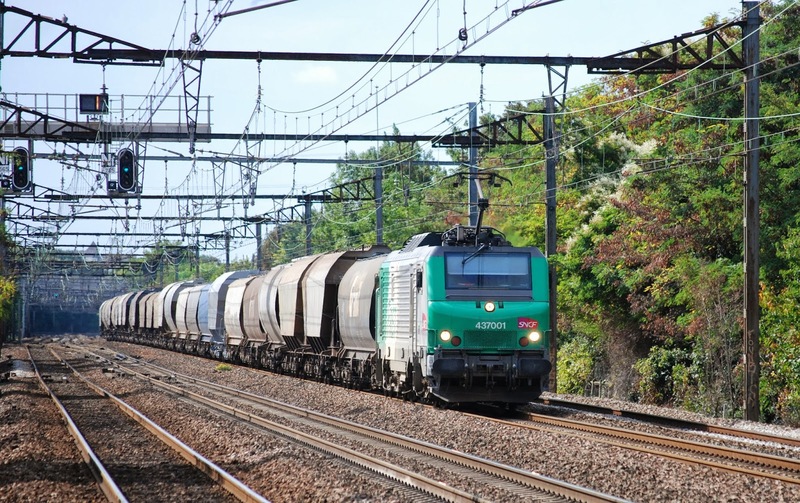 I have never been very sucessful at photographing freight trans in France but they do exist! I would advise that it is probably to pick a nice location where passenger will turn up regularly and just hope for the best! The two large freight yards in Paris that I am aware of are at Le Bourget (North East) and Villeneuve Saint Geoges (south). The RER B runs alongside the yard at Le Bourget, but I do not know of any good photo locations. BB37001 hauls a cereal train through Saint Michael sur Orge. I am not aware of anywhere to photograph freight at Villenuve- though a lot of it will go south through Juvisy. This is however a large sprawling station which is difficult to cover. I like the Paris Metro. It is an interesting and quite attractive system. There are several nice elevated sections- Line 6 (I think) Around the Eiffel Tower springs to mind, as well as Line 2 just north of Gare du Nord (it crosses over the ends of the platforms). Several lines also use trains which use rubber tires for traction in addition to the more conventional metal wheels.